In the NFL, there's a Fourth Down Bot that calculates whether a team should punt, kick a field goal, or go for it on fourth down. I'd love to see something like that in hockey. Like, perhaps, a Pull the Goalie Bot, which calculates at what time the goalie should be pulled, based on the score, the scoring rates of the teams involved, the manpower situation, and the location of the most recent event (i.e. you don't want to pull the goalie in the defensive zone). Jason Demers was traded by the Florida Panthers to the Arizona Coyotes, for Jamie McGinn. That gives the Coyotes the sensational top four of Ekman-Larsson, Hjalmarsson, Goligoski, and Demers, and depletes Florida's to read Ekblad, Yandle, Petrovic, Matheson. There's some offensive punch there, but that's not exactly a lineup that Crosby will struggle to score against. Meanwhile, McGinn is a depth winger with an annual cap hit of $3.33 million. Yowch. In Hockey Abstract 2017, I wrote the following about Florida's reputation for being a pro-analytics team. This move is yet another example that building an analytics team is different than actually using them. If you judge a team's adoption of analytics by how many of their moves meet with agreement from the analytics community, Florida is average, at best (and dropping). Instead, teams like Nashville, Carolina, Pittsburgh, and Arizona are the ones who appear to be including the opinions of the number crunchers in their decision-making. Of course, if there's a criticism for teams like Nashville, Arizona, and Carolina, it's the enormous amount of wasted cap space they have. Colin Cudmore just updated his list of the wasted cap space throughout the league, and there are three teams in equally bad situations - Colorado, Columbus, and Toronto. I saw an interesting post from Brent Severyn on Twitter. Apparently, Ken Hitchcock is coaching the biggest team he's ever had. Not only did Dallas add a great coach and plenty of size, but they added Ben Bishop in nets, Marc Methot on the blue line, and Martin Hanzal and Alexander Radulov up front. Yes, they paid a possibly excessive premium to get those players, but watch out for the Stars this year. I had a few polls this week, let's take a look at the results. Let's start with more on Erik Karlsson. Despite likely missing only about a dozen games, his injury is seen as the most significant blue line injury right now. I'll ask about forwards this week. If Karlsson misses a bunch of games and doesn't win the Norris, then that opens up the door for someone new -- assuming that it doesn't go to a usual suspect like Brent Burns, P.K. Subban, Drew Doughty, or Duncan Keith. If it does go to someone new, who might it be? Victor Hedman, apparently. That might be a case of recency bias. Hedman finished third in the voting last year, while the others received their Norris consideration in years previous. I was also scolded for leaving off Shea Weber -- my bad! I honestly thought he had already won. He finished second a couple of times, but he has never won. I might have to re-run this poll with Weber instead of Suter. Last poll of the week, it was about players aged 37 and up. Who is likely to win the old-timers scoring race? 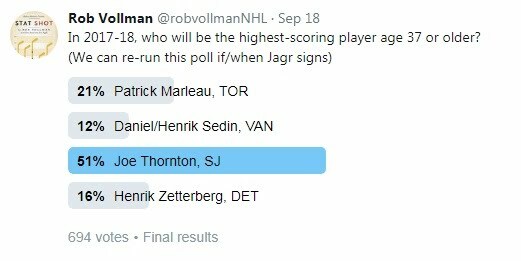 Joe Thornton was the choice, despite being outscored 68 to 50 last year by Henrik Zetterberg. A new Patreon campaign was launched, for Natural Stat Trick. It's in our own naked self-interest to get as many financial resources as possible in the hands of those with sites like these. If you are in a position to contribute, here are the four current Patreon campaigns, to my knowledge. In closing, here's an updated list of important dates, provided by our friends at Cap Friendly. Most importantly, the Waivers period begins tomorrow.